The horse’s eye is quite large (although small compared to total body size) and is positioned to allow vision to the front and the sides at the same time, without the horse having to turn its head. In fact, horses can see in all directions, except immediately behind themselves. However , the size and position of the eyes do predispose them to injury. 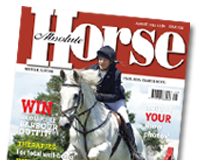 In this issue Deidre Carson BVSc(Syd), MRCVS from Rossdales looks at the structure of the equine eye and explains the common problems.